I am really excited with the progress we are making with installing multiple fully functional TRX systems. This week we have set up our first mount and soon we will have the second mount up! This gives us capability to conduct individual and small group TRX classes. Navy Seal Randy Hetrick needed a way to maintain the demanding fitness level required of a Seal member while often in limited space to do so. On one particular mission he was holed up in a small room for a considerable amount of time and he rigged a suspension system out of a jiu jitsu belt and some parachute webbing. Combining suspension and his body weight, even in the limited space he was able to adequately able to workout. Hetrick began utilizing the mesh straps and the help of the skills of the parachute shop to continuously improve the suspension system. His unique body weight suspension invention became a favorite of his fellow Seal members for staying fit. Hetrick eventually left the military and earned his MBA from Stanford University and develops the first of @TRX Suspension Training. TRX essentially uses an individual’s body weight to supply all the resistance needed to develop or maintain muscle. Body angle and position allow the individual to increase or decrease the level of difficulty. As a qualified TRX trainer, I like having the ability to allow the individual to choose their level of difficulty, while offering suggestions when they are struggling or need to be challenged more. The most challenging aspect of TRX is just getting comfortable with using the straps. To help with this and to provide the best possible experience, we offer one on one sessions and will also have pre-class periods of instruction. We will not want anyone feeling uneasy about the equipment while they are going through a workout. Also, our beginner classes will be a great way for those who feel they want a slower pace class to get comfortable with. We will make sure no one ever feels uncomfortable with participating in any of our classes. TRX is an awesome and effective workout experience for all ages and levels. Safe and fun! Currently we are offering individual and partner TRX training, and in March we will expand to small group classes. 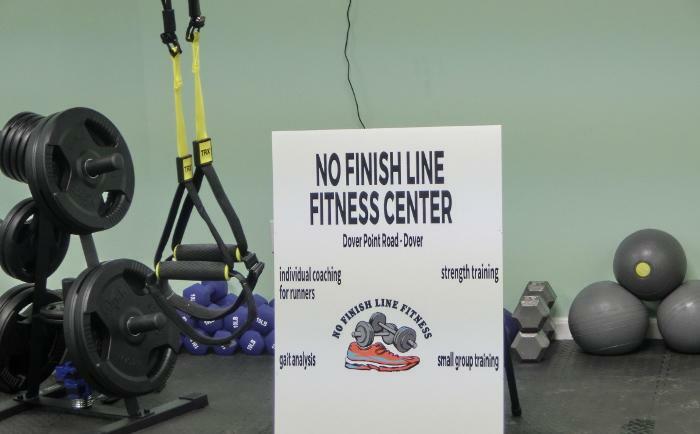 Contact us at info@nofinishlinefitness.com if you would like a free introduction workout, or more information. I am also working on a TRX strength training for runner’s specific workout. This workout will be the perfect opportunity for runners to gain full body strength enabling them to run stronger and reduce the chances of injury. I will say goodbye for now. I hope you enjoyed learning about TRX!